Topic: population and associated issues, poverty and developmental issues. A report titled ‘Reward Work, Not Wealth’ has been released by the international rights group Oxfam. The report reveals how the global economy enables wealthy elite to accumulate vast wealth even as hundreds of millions of people struggle to survive on poverty pay. The richest 1% in India cornered 73% of the wealth generated in the country last year. Besides, 67 crore Indians comprising the population’s poorest half saw their wealth rise by just 1%. The wealth of India’s richest 1 per cent increased by over Rs. 20.9 lakh crore during 2017, an amount equivalent to total budget of the central government in 2017–18, Oxfam India said. This presents a worrying picture of rising income inequality. Globally, 82% of the wealth generated last year worldwide went to the 1%, while 3.7 billion people that account for the poorest half of population saw no increase in their wealth. 2017 saw an unprecedented increase in the number of billionaires, at a rate of one every two days. Billionaire wealth has risen by an average of 13% a year since 2010—six times faster than the wages of ordinary workers, which have risen by a yearly average of just 2%. The survey also showed that women workers often find themselves at the bottom of the heap and nine out of 10 billionaires are men. In India, there are only four women billionaires and three of them inherited family wealth. Oxfam makes several recommendations to start fixing the problem of income inequality. On the government’s part, it has asked for things like promoting inclusive growth by encouraging labour-intensive sectors that will create more jobs, imposing higher tax on the super-rich, implementing policies to tackle all forms of gender discrimination and sealing the “leaking wealth bucket” by taking stringent measures against tax evasion. 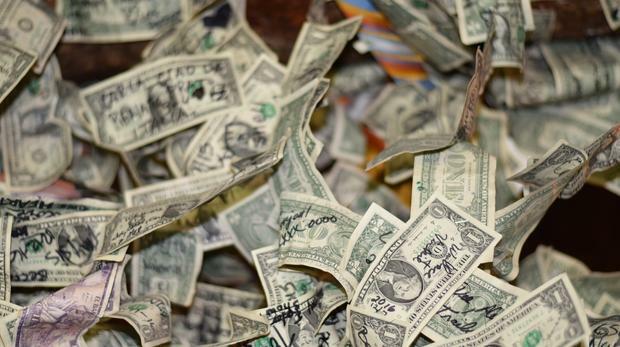 The report reveals that the top 1% is evading an estimated $200bn in tax. More significantly, developing countries are losing at least $170 billion each year in foregone tax revenues from corporations and the super-rich. The recommendations for corporations are far more eyebrow-raising, be it “Limit returns to shareholders and promote a pay ratio for companies’ top executives that is no more than 20 times their median employees’ pay” or refraining from rewarding shareholders through dividends or buybacks or even paying bonuses to executives until “all their employees have received a living wage”. The survey found that, in India, it will take 941 years for a minimum wage worker in rural India to earn what the top paid executive at a leading Indian garment firm earns in a year, the study found. In the US, it takes slightly over one working day for a CEO to earn what an ordinary worker makes in a year. Therefore, the survey stressed that the gap between the rich and the poor needs to be urgently addressed. Context: The fifth edition of the Global Talent Competitiveness Index has been released by INSEAD in partnership with The Adecco Group and Tata communications. Launched for the first time in 2013, the Global Talent Competitiveness Index (GTCI) is an annual benchmarking report that measures the ability of countries to compete for talent. The index that measures how countries grow, attract and retain talent. With this fifth edition, GTCI addresses the theme of Diversity for Competitiveness. India has moved up to the 81st position, but remains a laggard among the BRICS nations. India was at the 92nd position last year and at the 89th place in 2016. Among the five BRICS countries China is at 43rd, Russia 53rd, South Africa 63rd and Brazil 73rd. Switzerland has topped the list. It is followed by Singapore and the US. European countries dominate the top ranks, with 15 out of the top 25 places. What is it? 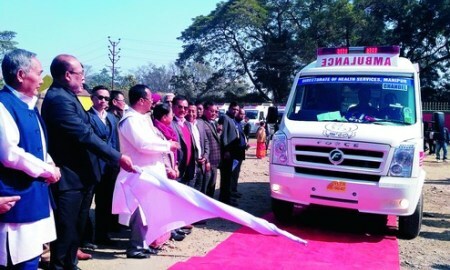 It is Manipur government’s pioneering health assurance scheme for the poor and disabled people. The scheme will provide cover up to Rs 2 lakh per eligible family identified from the Socio Economic Caste Census (SECC) in the treatment of seven critical identified critical ailments – cardiovascular diseases, kidney ailments, neurological conditions, liver ailments, cancer, neo-natal diseases and burns per year. The most special aspect of the scheme is its innovative features. Firstly, CMHT will have convergence with Government of India programme like PMÂ’s Jana Aushadhi Programme and Free Diagnostic Programme. Secondly, the scheme will be a truly IT platform driven scheme. Context: Mounting pressure on New Delhi to give an early consent to the Regional Comprehensive Economic Partnership — a mega regional trade pact being negotiated by sixteen nations — the 10-member ASEAN expressed hope that India would not let the bloc down in its efforts to conclude the agreement this year. India has, however, refused to take responsibility for the long-winding negotiations and has stressed that it is important to address the sensitivities and aspirations of all participants. India is not comfortable with the ambitious dismantling of import tariffs being pushed for by the ASEAN, especially as it would also mean allowing duty-free access to Chinese goods. The Indian industry does not want the country to commit to high levels of liberalisation as it fears that it could get out-priced in the domestic market. 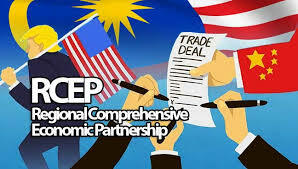 RCEP negotiations were formally launched in November 2012 at the ASEAN Summit in Cambodia. RCEP aims to boost goods trade by eliminating most tariff and non-tariff barriers — a move that is expected to provide the region’s consumers greater choice of quality products at affordable rates. It also seeks to liberalise investment norms and do away with services trade restrictions. Context: The Union Water Resources Ministry has released central assistance of Rs 246.9 crore for nine prioritised projects under the Pradhan Mantri Krishi Sinchayee Yojana (PMKSY) for Accelerated Irrigation Benefits Programme (AIBP) works. The scheme will be implemented by Ministries of Agriculture, Water Resources and Rural Development. 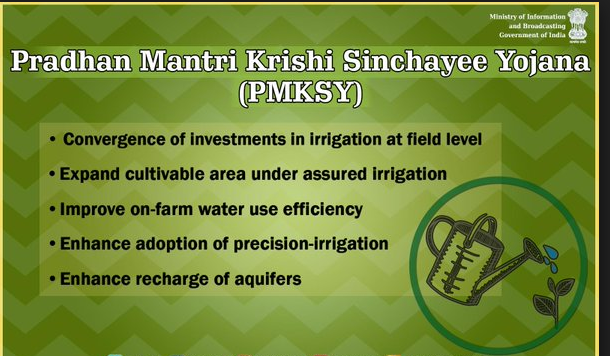 The major objective of PMKSY is to achieve convergence of investments in irrigation at the field level, expand cultivable area under assured irrigation, improve on-farm water use efficiency to reduce wastage of water and enhance the adoption of precision-irrigation and other water saving technologies (More crop per drop). The Accelerated Irrigation Benefit Programme (AIBP) was launched during 1996- 1997 to give loan assistance to the States to help them complete some of the incomplete major/medium irrigation projects which were at an advanced stage of completion and to create additional irrigation potential in the country. Grant component has been introduced in the programme from April 2004 like other Central Sector Schemes. Context: Inclusive Development Index has been released by the World Economic Forum. This Inclusive Development Index has been developed as a new metric of national economic performance as an alternative to GDP. The index takes into account the living standards, environmental sustainability and protection of future generations from further indebtedness. The 2018 index, which measures progress of 103 economies on three individual pillars — growth and development; inclusion; and inter-generational equity — has been divided into two parts. The first part covers 29 advanced economies and the second 74 emerging economies. The index has also classified the countries into five sub-categories in terms of the five-year trend of their overall Inclusive Development Growth score — receding, slowly receding, stable, slowly advancing and advancing. India is placed at the 62nd place among emerging economies much below China’s 26th position and Pakistan’s 47th. 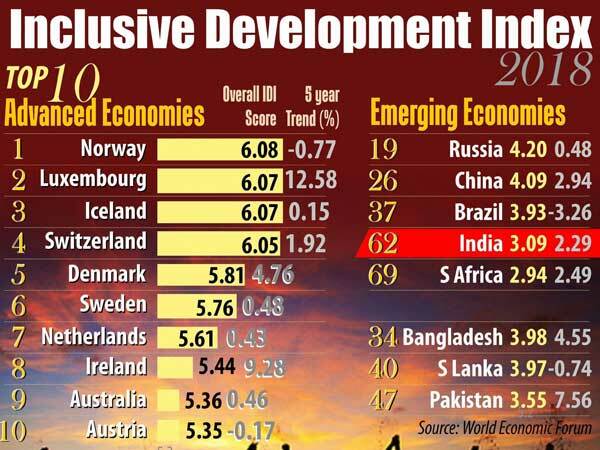 India was ranked 60th among 79 developing economies last year, as against China’s 15th and Pakistan’s 52nd position. Despite its low overall score, India is among the ten emerging economies with ‘advancing’ trend. Only two advanced economies have shown ‘advancing’ trend. Of the three pillars that make up the index, India ranks 72nd for inclusion, 66th for growth and development and 44th for inter-generational equity. Performance is mixed among BRICS economies, with the Russian Federation ranking 19th, followed by China (26), Brazil (37), India (62) and South Africa (69). The neighbouring countries ranked above India include Sri Lanka (40), Bangladesh (34) and Nepal (22). Norway remains the world’s most inclusive advanced economy. Among advanced economies, Norway is followed by Ireland, Luxembourg, Switzerland and Denmark in the top five. Lithuania again tops the list of emerging economies. It is followed by Hungary, Azerbaijan, Latvia and Poland. The study found that decades of prioritising economic growth over social equity has led to historically high levels of wealth and income inequality and caused governments to miss out on a virtuous circle in which growth is strengthened by being shared more widely and generated without unduly straining the environment or burdening future generations. Excessive reliance by economists and policy-makers on Gross Domestic Product as the primary metric of national economic performance is part of the problem. The GDP measures current production of goods and services rather than the extent to which it contributes to broad socio-economic progress as manifested in median household income, employment opportunity, economic security and quality of life. The report has cautioned political and business leaders against expecting higher growth to be a panacea for the social frustrations, including those of younger generations who have shaken the politics of many countries in recent years. It has also urged the leaders to urgently move to a new model of inclusive growth and development, saying reliance on GDP as a measure of economic achievement is fuelling short-termism and inequality. Context: The union environment ministry has decided to start a ‘Himalayan Research Fellowships scheme’. This is among the series of programmes that MoEFCC is running for conservation and protection of Himalayas. Aim: The scheme aims scheme’ to create a young pool of trained environmental managers, ecologists and socio-economists. This pool will help generate information on physical, biological, managerial and human aspects of Himalayan environment and development. Implementation: The fellowship scheme will be executed through various universities and Institutions working in the Indian Himalayan Region (IHR) and preference will be given to the Institutions from north-eastern states. Funding: The financial support will be provided under the National Mission on Himalayan Studies (NMHS) and the fellowships will be awarded for a maximum period of three years and last date for submitting fellowship proposals is 12 February. Focus areas: The research may be undertaken in any of the identified broad thematic areas (BTAs) of the NMHS. Some of the broad thematic areas that are being focused on for research under the NMHS are water resource management including rejuvenation of springs and catchments, hydropower development, assessment and prediction of water-induced hazards, livelihood options including ecotourism opportunities, biodiversity management including recovery of threatened species and skill development. Next story Insights MINDMAPS: “Annual Status of Education Report (ASER) 2017”.